I’ve got two deals from Sears today to share with you! The first one is a Stanley 40 Amp Automatic Car Battery Charger w/ LCD Display, 1-Touch Technology & Moisture Protection for $49.99! One of our vehicles is always in need of a boost! It seems if you don’t drive it for a few days that the battery dies. John is forever using my car to boost his truck. 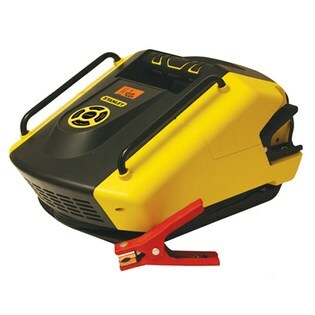 I need to pick him up one of these Stanley Automatic Car Battery Chargers so he won’t have to use my vehicle anymore. Charging your car battery is a breeze with this Stanley Battery Charger. This innovative device automatically selects a charge rate from 0 to 40 AMPS to maximize battery life, charge speed and maintenance. The easy to read digital-display LCD screen offers clear and concise information. Other features include spark resistant reverse hook-up protection, microprocessor controlled digital diagnostics and a moisture protection coating. The second deal today is a Levana LV-TW502 Monitor for $104.99 at Sears! My babies are no longer babies anymore (age 14 & 8), but I remember all too well how nervous I was when they were little. I was always checking on them when they were sleeping and I would have loved to have owned a video baby monitor like this one. It would have given me peace of mind and let me know they weren’t getting into any mischief! Levana provides products that offer style and functionality to the parents of newborns and toddlers. They are focused on researching, developing and distributing products that help you be the best parent you can be. Their product designs are kid friendly and aesthetically pleasing to fit your decor. You want the best for your growing family. That is why we take pride in delivering high-quality products that you can truly rely on. Choose the best for your little one, choose Levana. The Safe n’See Advanced is LEVANA’s unique wireless video baby monitor with ClearVu Digital technology. See and hear your baby with unbelievable precision up to 500 ft away. You will be able to confidently do the things you want while still ensuring your baby is safe!